A trip to Trader Joe’s is just as educational as the zoo, right? A quick morning errand turned into an education for mom & tot. Visiting the new Trader Joe’s on Telegraph Rd. and Maple (15 Mile Rd.) gave B the chance to explore hands- on fruits, vegetables, dairy and grains from around the globe. Sipping coffee from a just-his-size sample cup (what, your toddler doesn’t like coffee?) 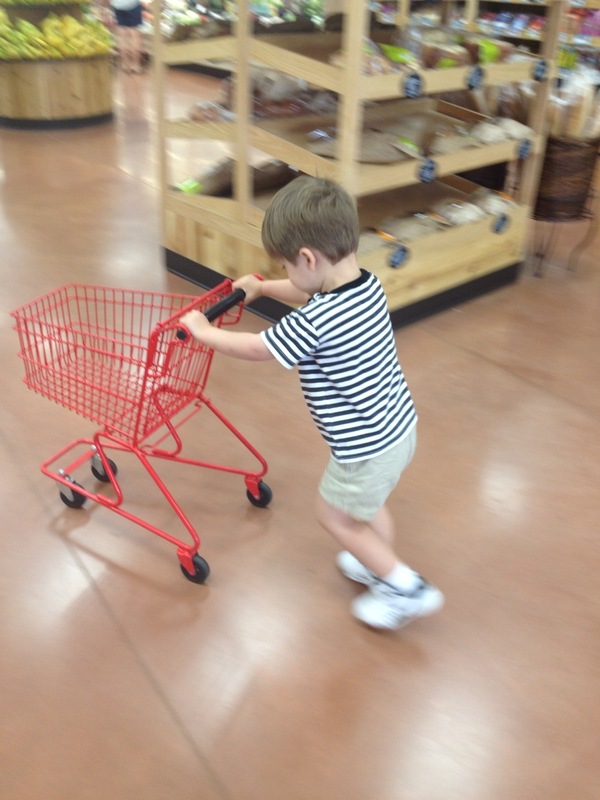 and pushing his cart, he was allowed to be the “big boy” that he so fiercely proclaims to be. We talked about colors, letters, shapes, smells and textures all while trying to watch our manners (no running into the ankles of other patrons with your cart). B showed me and everyone at the store he was more than worthy of that free organic lollipop the cashier offered him. Zoo, schmoo, how can watching a seemingly lifeless lioness (no matter how close that new glass enclosure can get you) compare to cool air conditioned independence?? Thank you Trader Joe’s, see you next week! This entry was posted in To do in Metro Detroit and tagged detroit, errands with toddler, grocery store toddler, shopping with toddler, terrible two's, toddler, zoo. Bookmark the permalink. Wish there’d be a Trader Joe’s there when I was there! I shopped at Frank’s on 10 Mile and Jefferson and at Salvaggios on Harper. I miss these places so MUCH! And I miss Michigan and my house and my huge garden . . . . sigh. Yes, we love our Trader Joe’s!